Monkey see, monkey do. Kids learn by copying. Mimicking surroundings and people in their lives is an incredibly useful skill. My youngest is 2 now and anything his big brothers can do, he can do better. Or so he thinks… he copies everything they do, right down to their mannerisms. It’s hilarious. Loki is fast growing up and instead of getting nostalgic over how tiny he was I’m embracing the change and watching as he develops into a proper wee boy. My husband and I have recently noticed that that way Loki plays has suddenly changed. His imagination has flourished and it’s opened up some lovely opportunities for role play. I’m a huge fan of Plan Toys, they’re ethically made, well made, painted with toy safe dyes and their prices are suitable for any budget. They’re my go to for gifts too and they’re always well received. Having 3 boys and being the only woman in the house is interesting because they’re always fascinated on the occasions I put make up on, paint my nails or dye my hair. We’ve got the Make Up set from Babipur to play with and it is amazing. I don’t foresee me doing an eyeliner demo with them anytime soon but when I have grumpy teenagers insisting on exploring their identities who knows what will happen! I don’t wear much make up but when I do I have to endure Loki (and Oren usually too) raiding my wee bag and trying to get a shot of my mascara and lipstick. The fab set includes; eye shadow palette, compact mirror, a small mirror, perfume with a clever squirt button, lipstick, eyeliner, make up brush and it all comes in a little blue carry bag. I do enjoy a bit of eye shadow on those days when coffee doesn’t quite do the job. I particularly love that the palette that comes in this set is rainbow coloured so we can do face paint style role play. We pretended to put bright orange on so we could be tigers, bright green so we could be dragons, red like crabs. It was lots of fun. Great for colour identification and hand (literally) to eye coordination skills with the brush. The lipstick is fab as the lid comes off and it’s perfect to satisfy that things into things toddlers love so much. We use lip balm on the boys (Scottish winds are brutal!) so again it’s great to copy that and help him learn to put it on himself. The little compact with a mirror provides obvious entertainment, sometimes laughing and playing peek-a-Boo with your own reflection is the best way to spend 20 minutes! The perfume is my personal favourite. Who doesn’t love pushing buttons?! I love that it mimics an actual spray on a real perfume bottle. I’ve had to move mine out of sight as well as reach now though because all the work with his fingers has noticeably improved his muscle tone and means he’s now quite adept if he gets hold of mine! This make up set is definitely something to keep in mind for gifts. I have plenty of niblings so there’s a good chance I’ll be buying this as a gift really soon! 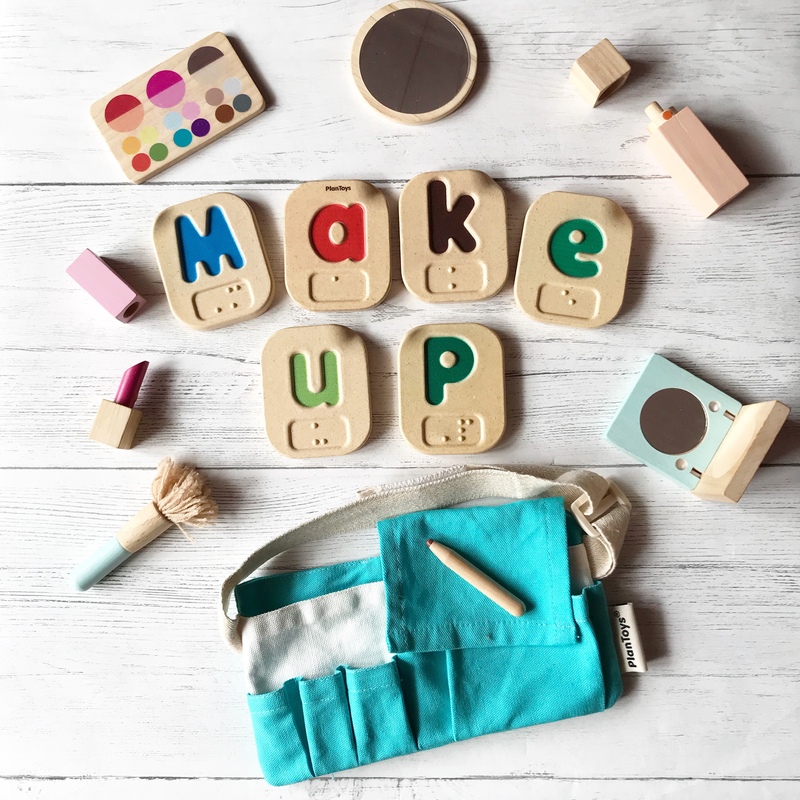 You can find the make up set here from Babipur! It’s Plan Toys week over on their Instagram to celebrate the founders Peter and Jolene going off on an adventure to Thailand to see and meet everything Plan Toys! Please go have a nosey! It looks like great fun. Great to show them that makeup isn’t gender specific too!